Head here for our five worst but let’s start with the good part. As it stands, the 2019 British Grand Prix is set to be the last to be held at the iconic Silverstone circuit. The 2018 race showed more concrete evidence, if any were needed, that simply should not be allowed to happen. It is far too good to say goodbye to. We were firstly treated to one of the most electrifying qualifying sessions in recent times, with a mere 0.098 seconds separating the top three of Lewis Hamilton, Sebastian Vettel and Kimi Raikkonen. Hamilton was gunning for a record sixth British Grand Prix victory, but that dream quickly faded away when getting bogged down at the start and then swiftly sent into a spin by Raikkonen. From P1 to P18 in a matter of moments, it left a downbeat Hamilton having to work his way through the pack again. After just 11 laps, he was back up to P6 and ready to play his part in an enthralling battle between the Formula 1 heavyweights, provoked by the introduction of not one, but two Safety Cars in quick succession. Marcus Ericsson forced the first SC when going through the flat-out Turn 1 with his DRS flap wide open and crashing at approximately 190mph. As he walked away unhurt, the incident prompted Ferrari and Red Bull to double stack their cars in the pit lane, while Mercedes stayed out and tried to defend track position. 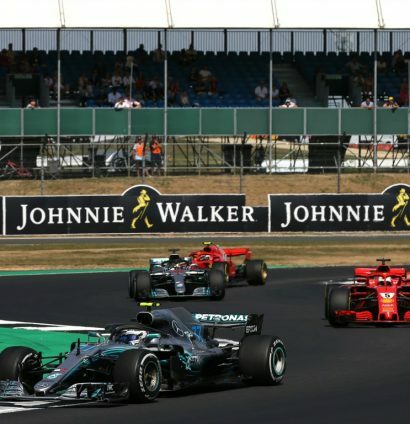 Even before we got stuck into a fascinating finale, there was a superb battle between Raikkonen, having served his 10-second penalty for hitting Hamilton, and Max Verstappen through Brooklands and Luffield. Then Carlos Sainz and Romain Grosjean collided at Copse corner to force the second Safety Car and slowly build the tension as we awaited the grandstand finish. It didn’t disappoint either, with Bottas defending the lead valiantly before Vettel swept through majestically to retake the race lead with the chequered flag fast approaching. Hamilton also found a way past to clinch P2 with Raikkonen taking the final spot on the podium. 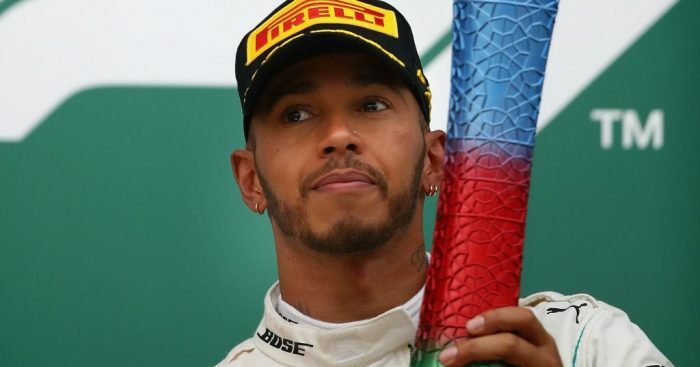 Lewis Hamilton had already wrapped up his fifth World Championship title by the time Brazil came around and Mercedes were well on course of adding a fifth Constructors’ Championship. This race should have been a mere formality. However, we were given a late-season treat with some of Formula 1’s big dogs fighting it out in close quarters throughout the race – something we unfortunately don’t see very often. Mercedes, Ferrari and Red Bull were all on differing strategies and it was the latter team that came to life through a mighty surge from Max Verstappen. He dispatched of both Kimi Raikkonen and Sebastian Vettel, before making light work of Valtteri Bottas. Next in the Dutchman’s sights was Hamilton, who would become a dot in Verstappen’s mirrors. That was until, of course, Verstappen met his old Formula 3 rival, Esteban Ocon, who was trying to unlap himself against the clear race leader. Contact was made at Turn 2 and Verstappen, facing the wrong way, could only watch on in pure fury as Hamilton flew past to take the race lead once again. With a damaged RB14 to work with, it was essentially game over for Verstappen. But, he kept pushing (in more ways than one, it turned out) to come agonisingly close to clinching what would have been a deserved win. Just 5.2 seconds separated the top four at Interlagos as Daniel Ricciardo, on a fine recovery mission, made Raikkonen work incredibly hard to keep hold of his podium spot. Hopefully the new aerodynamic regulations in 2019 will lead to more close-quarters action like this race provided. A race of biblical proportions…and we are not just talking about the weather. With Lewis Hamilton seemingly out of contention for race victory after suffering a breakdown in Q1 on the Saturday, pole-sitter Sebastian Vettel was primed to break his duck at the Hockenheimring and extend his World Championship lead. But, the longer the afternoon went on, the more frustrated Vettel became. A difference in strategy meant team-mate Kimi Raikkonen had the race lead at the mid-way point and, in turn, affected Vettel’s tyre performance as he struggled in the dirty air behind. It appeared that the drama was over once Raikkonen finally made way to let Vettel back through, but the very localised rain showers that arrived turned this race into a fantastic frenzy with the home favourite making all the headlines… for the wrong reasons. 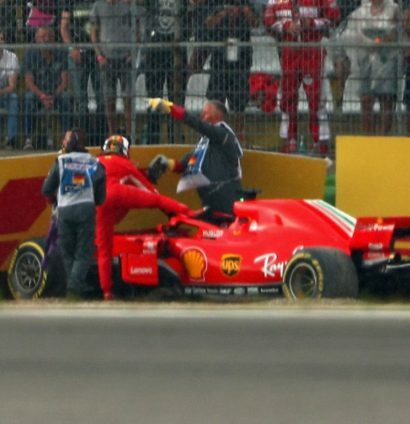 Gasps could be heard from all over the world as Vettel, in the increasingly slippery conditions, lost control at the Sachskurve and hit the barrier in full view of the grandstand section packed with his fans. It was game over for a distraught Vettel, but he encapsulated the chaos that the interchangeable weather conditions brought. It was bone dry on some parts of the track, soaking wet in other sections, prompting tyre gambles up and down the field. At one stage of the race, the ultrasofts, the softs, the mediums, the intermediates and full wets (looking at you, Pierre Gasly and Toro Rosso), were all on show. Valtteri Bottas and Raikkonen came into the pits whilst the Safety Car came into effect following Vettel’s dramatic exit, and it looked like Hamilton, who had worked his way back from P14 on the grid, was going to follow suit until a flurry of panicky radio messages resulted in the Brit cutting back across the pit lane and holding onto what would have felt like an unfathomable race lead at the start of the afternoon. When the Safety Car peeled away again, Hamilton, with the benefit of some team orders, held off an attack from Bottas from his fresher tyres, while, further down the grid, the likes of Charles Leclerc and Sergio Perez provided more fireworks with spins in the difficult conditions. Hamilton held on for a remarkable victory, yet he had to anxiously await the stewards’ verdict as they took another look at his aborted pit stop. A nine-point deficit to Vettel had suddenly turned into a 17-point advantage. How quickly things can change in Formula 1. Kimi Raikkonen to the rescue! With Lewis Hamilton on pole and Sebastian Vettel down in P5 (due to a mistake) and then P15 at the end of lap one (see previous bracket), the firm expectation was that this World Championship ‘battle’ was finally over. We were all in for a pleasant surprise. 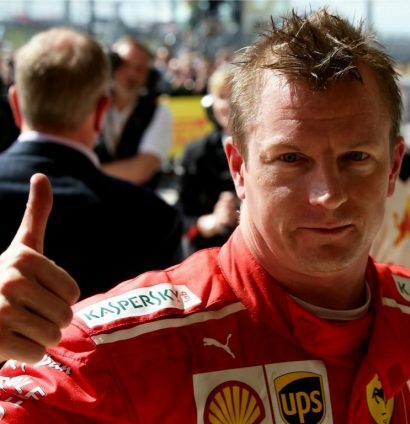 With the end in sight for Raikkonen at Ferrari, he rolled back the years with his first victory in 2,044 days and what a win it was, too. After finding a way past Hamilton at the start, he proceeded to hold the title-chasing Brit up and chucked in a pit-lane dummy for good measure as well. The drama and tension only continued to grow as Raikkonen, Hamilton and the fast-recovering Max Verstappen all battled for victory on alternative strategies. They were that close together in the final few laps you could have thrown a tablecloth over them. It was fascinating to watch. There was still plenty going on behind the front three, too. The agony of seeing Daniel Ricciardo retire again with a reliability problem, the anguish of witnessing Vettel spin out on the first lap and forced into yet another recovery drive, the chaos through the esses which saw Romain Grosjean, Charles Leclerc and Fernando Alonso all retire. The storylines kept flooding in after the race with Esteban Ocon and Kevin Magnussen both disqualified for fuel issues, giving rare points to Brendon Hartley and Marcus Ericsson. This race came very, very close to taking top spot. Well done Baku. 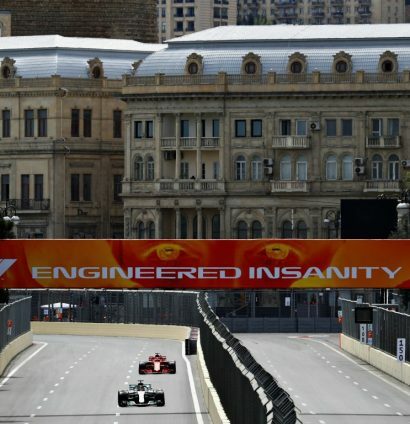 After the utter madness of the 2017 race in the Azerbaijan capital, its successor somehow managed to completely surpass our own very high expectations. Where to even start? There were two retirements after just three corners with Esteban Ocon and Sergey Sirotkin chewed up and spat out by this very unforgiving circuit. Nico Hulkenberg became another early DNF victim before we then had the infamous collision between Red Bull’s Daniel Ricciardo and Max Verstappen, which had been on the cards pretty much all afternoon. Romain Grosjean crashed behind the Safety Car; Valtteri Bottas was cruelly denied a well-earned victory with the checkered flag almost in sight as a piece of debris caused a race-ending puncture and Sebastian Vettel blew his chances by being a bit too daring going into Turn 1. Lewis Hamilton was the fortunate winner and was joined on the podium by Kimi Raikkonen and, most notably, Sergio Perez. Charles Leclerc officially emerged onto the Formula 1 scene with a P6 finish and Fernando Alonso arguably stole the show by essentially bring half a car back to the pits on lap one and somehow managed to finish P7 for a third consecutive race. We are out of breath just reading that back. A crazy, crazy race that will live long in the memory.